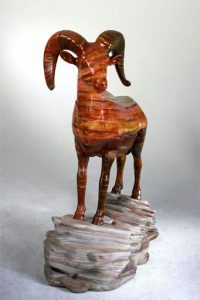 Big Horn Sheep – commissioned by Sidney & Alexandra Sheldon for its foundation. 2 of these were commissioned, both completed as part of the public art project to raise funds for the foundation, in Palm Desert, California. Both were life size resin forms, one completed in mosaic tiles and one completed in paint. At its term, the 2 pieces were delivered to the successful bidder. No Room for Hate – commissioned by City of Palm Springs and various other associated entities to celebrate diversity. This was a 54 foot mural designed and completed with various “at risk” high school students on Palm Springs, California. This Mural still stands. 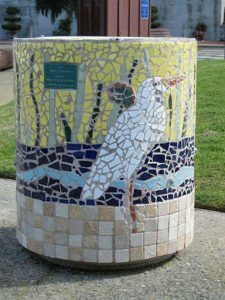 Trash Can Beautification – commissioned by Morro Bay Beautiful, the project entailed each artist to design and beautify a city trash receptor. This was completed in mosaic and is located on the City’s Embarcadero, Morro Bay, California. 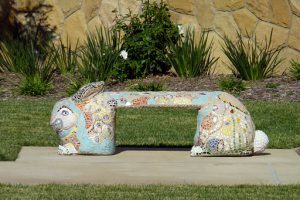 Bunny Bench – commissioned by Cottage Hospital in Santa Barbara. This life size bench was completed in mosaic and sits proudly as part of the children’s garden at Cottage Hospital. I am familiar with many types of products and how they react with and in various atmospheres and environments. Having worked with government codes as well as meeting installation compliance my pieces are structurally sound and safe. My public art is my legacy.